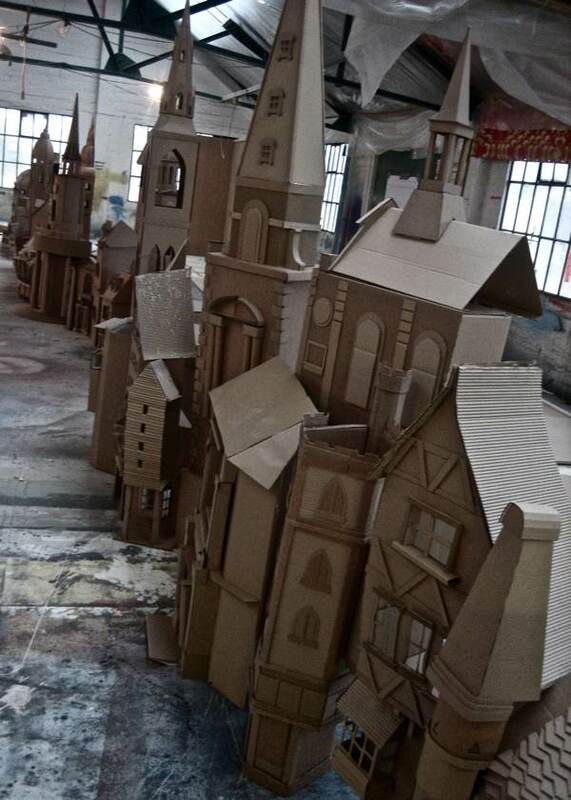 Just recently, I took the 42 bus from Liverpool St Station down to Camberwell to visit Simon Costin where he was working on the top floor of an old scenery warehouse, recreating the nineteenth century city out of cardboard boxes for the new exhibition Dickens & London which opens tomorrow at the Museum of London. 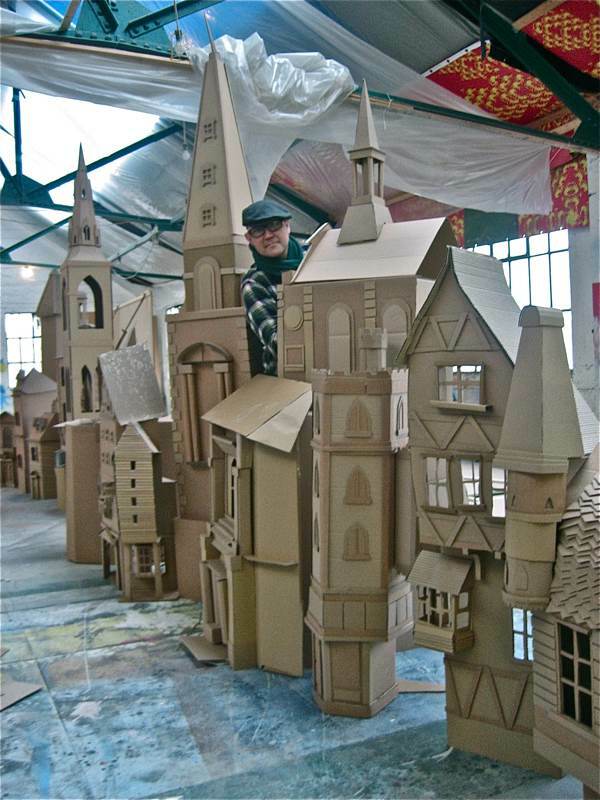 It sounded such a hare-brained scheme – a zany childhood fantasy writ large – that I could not resist going over to take a look, and I was not disappointed because I was confronted with a creditable terrace of tottering cardboard towers, even as I walked in the door. Simon and his team of four were busily cutting up cardboard boxes, sticking storeys and roofs together, slicing out panels for windows and doors, and attaching tiles and bricks individually. 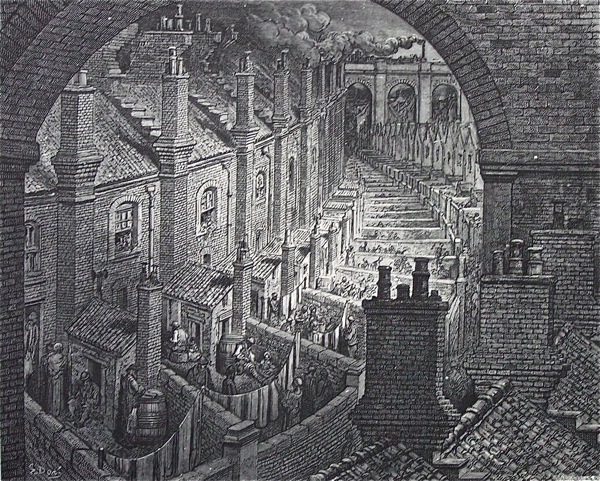 Scattered around were books of old photographs that served as references, yet this was no literal architectural recreation but rather a dreamlike impression of the monstrous shambolic city which Dickens knew and that we all visit through his novels. As each edifice was completed, Simon proudly carried it across the room and added it to the quickly-growing warren of structures he was assembling, shuffling and swapping his property portfolio critically, like a whimsical land magnate. 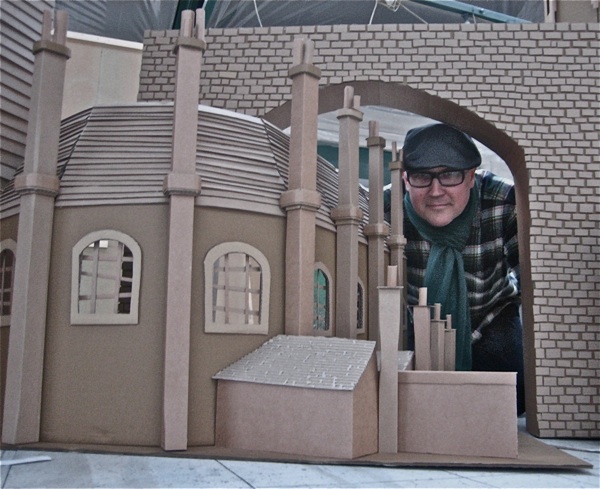 Just as Charles Dickens’ London was a location of mystery, an unknowable labyrinth of human life, so Simon Costin has brought his own story to the cardboard diorama through referencing the work of his great-great-grandfather, William Pettit Griffith, a forgotten architect. Only the almshouses in the Balls Pond Rd survive today out of Griffith’s work built in London in the nineteenth century, though he was also the architect who fought to save St John’s Gate in Clerkenwell and conceived its renovated form that we know today. In family lore, William Pettit Griffith was a shadowy figure who died in obscure poverty but Simon discovered a direct relationship with his long-gone forbear through an unlikely encounter with a stranger who revealed herself to have second sight. 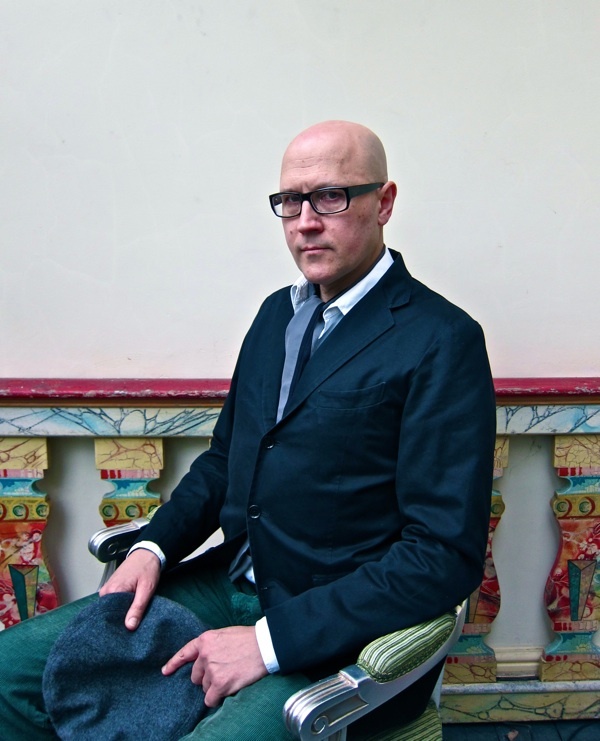 Two elderly women approached Simon in the tearoom at the Royal Academy. One explained that the other was blind yet blessed with a psychic gift and she saw a guardian angel at Simon’s shoulder. The figure she described was a Victorian gentleman with unusual hair that curled on both sides of his head, just as William Pettit Griffith’s hair does in the only portrait, which you see below. This uncanny experience led Simon to research his enigmatic ancestor and he found they had lived in close proximity – as if they followed each other around London, one hundred and fifty years apart. Simon once squatted in a flat at 67 Guildford St and Griffith had lived at 117. Then, Simon moved to a flat that turned out to be around the corner from Griffith’s practice in Bermondsey. Next, Simon had a studio on Wharf Rd in Islington, close to Eagle Wharf Rd where Griffith had lived, and now Simon lives five minutes from the almhouses, the last Griffith building standing. Dickens’ novels are full of long-lost relatives reunited through chance. A phenomenon that both confirms the dislocation of people in the teeming city, yet reveals the underlying connections which are usually hidden. 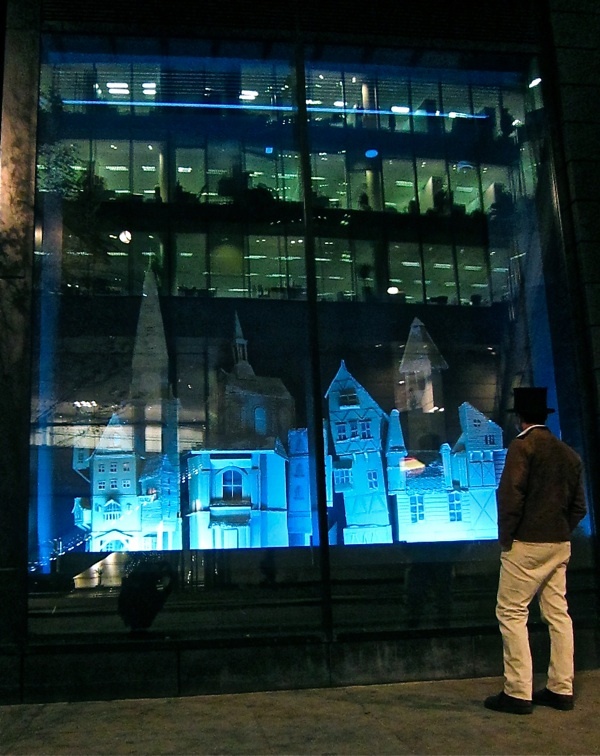 Simon’s discoveries have brought him into a personal relationship with the nineteenth century city, and he has envisaged his nocturnal diorama of London as a place of wonder, of horror and awe. Part of the diorama at the Museum of London, seen from London Wall. 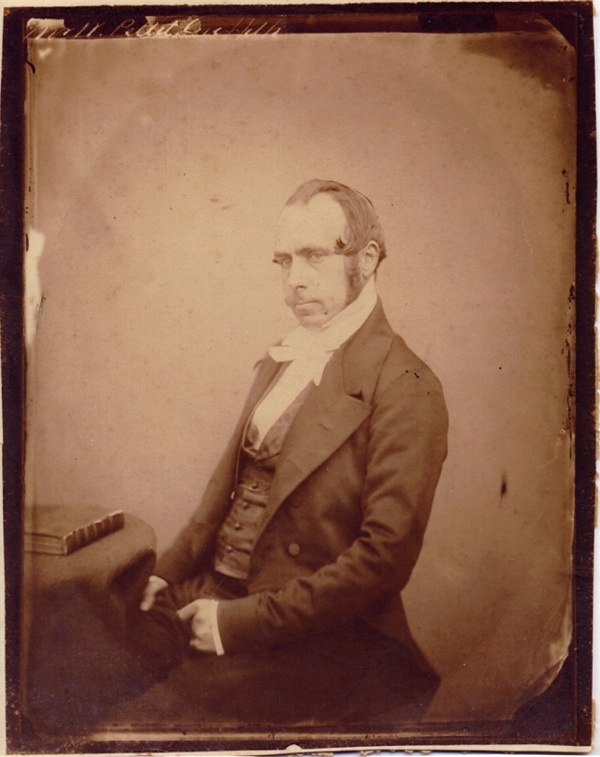 William Pettit Griffith, Simon Costin’s great-great-grandfather. Simon Costin was assisted in creating his diorama by Jenna Rossi-Camus, Rachel Champion, Russell Harris and Yasemen Hussein. Wow! Great piece. Great story, great man, great diorama! I like to think of myself as one of the most sceptical people around but I must admit the story of the two ladies in the Royal Academy made the hair stand up on the back of my neck. The botanical drawing is lovely and strikingly modern. Could easily see it as a St Judes print. The Museum of London is my most favourite museum and Dickens is my most favourite figure, so to have the two combined is a dream come true! I dearly hope the exhibition is extended as I’m not moving back to my birthplace until next June, and a June 10th closing is going to be pushing it a bit!! cardboard cities. guardian angels. umbra sumus. I wish I was anywhere near London to see this! I find this type of whimsy totally affirming. You don’t have to be cheerful to be whimsical. I knew ……I just knew you would have to write about the wonderous cardboard creations of simon and his team…..and I am glad you did ! Superb stuff! Wish i could come down and explore, and hopefully get lost….! How long did it take? Fantastique! Fantastic work ,much appreciated , excellent Portrait of WPG . We must meet up . Congratulations Dear Simon to you and your team. Excellent work. Don’t ever loose your sense of wonder. Lovely to see the drawings and Photo of WPG. Mother. Well done Simon, Another triumph! We are looking forward so much to seeing it in person in May. Love the refernces to our Great Grandfather WPG. WPG is also my 2nd great grandfather, and i havent found anything to suggest he lived at 117 guilford street, he lived at number 9 and 16 guilford street ( 1861 / 71 / 81 england census, and marriage banns ), he was married to a miriam jones, a welsh woman by birth, ( denbighshire ), william was born on the 7th july1815, and died 04/09/1884, he was a member of numerous architectual societies and even had a hand in kensal green cemetery. he also has a room named after him in the rookery hotel in london. in 1854 he finished runner up in a competition of the institute of architects winning a silver medal. on ancestry go to search,…..card catalogue…..in keywords enter clerkenwell and click the only link there, pinks history of clerkenwell, in there you will find a lot about william pettit.